“I guess they decided it was a missed test, which really doesn’t make sense. Anyone would logically think that I would have to be home 24 hours a day, or I get a missed test,” Williams told a press conference today. Williams, preparing for the start of Wimbledon tomorrow, made it clear she didn’t expect to have been tested so often this year. 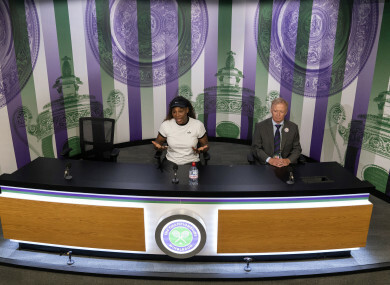 Concerned at being tested more than her fellow American players, seven-time Wimbledon winner Williams revealed she had spoken to USADA chiefs. The 36-year-old said she was tested five times by June, compared to one or none from some of her compatriots. “I had a conversation with the lead guy with USADA. I think he was mentioned, as well. How is it I’m getting tested five times in June? It’s only June, I’ve been tested five times. I’m okay with that. “Literally verbatim, I said, I’m going with that, as long as everyone is being treated equally. That’s all I care about. “I despise having people in our sport that aren’t being honest. I’m totally okay with testing and I encourage it. “If that’s testing everyone five times, let’s do it. Let’s be a part of it. It’s just about being equal and not centreing one person out. Roger Federer, the reigning Wimbledon men’s champion, backed Williams’ claim that testing procedures need to be overhauled. “I’ve had a lot of testing the last month. I think I’ve had seven tests. Where I live in Switzerland, the tester lives in the same village, so it’s very convenient!” he said. “But I mentioned many times in Dubai I’ve hardly ever been tested, which has been quite disappointing. To honest, in the 15 years I’ve been there, it’s been one test. “Maybe that’s the part I don’t like so much, the inconsistency of the places where they test. “What’s important is these people are professional, they treat you like humans, not like criminals. Email “Serena Williams asks for fair treatment around drug testing”. Feedback on “Serena Williams asks for fair treatment around drug testing”.